The sisters Berta Sacof (1899-1989), Helen Bloom (1901-1987) and Jeannette Britton (1910-1991), born Berta, Helen and Jeannette Strimer were from a comfortable middle class background in Bristol and led completely conventional lives until they seem to have had a collective political awakening in the 1940s. They went on to lives of tireless political and community activism. For a while, all three were simultaneously Bristol city councillors; two became aldermen and one became Lord Mayor. 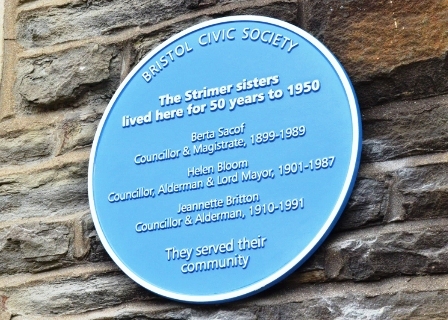 Sitting on various council committees and other local organisations they played a significant part in shaping modern Bristol in everything from health and education to criminal justice. Use the following link for photographs of the unveiling on our Facebook page.